This shirt is well worth the money spent. It fits pretty darn well, apart from a couple places (in which I'd blame me for bad measurements rather than the folks at MT). The fabric is lightweight but not flimsy. Overall, I'd say it's worth the money I paid (I believe $40 including shipping, which was exorbitant - $15 or so - since it came from China). I chose these options for my shirt. The shirt itself cost me $26.95. You can see in this picture that the shoulder seams are darn near perfect (ending up right at the corner of my shoulder). 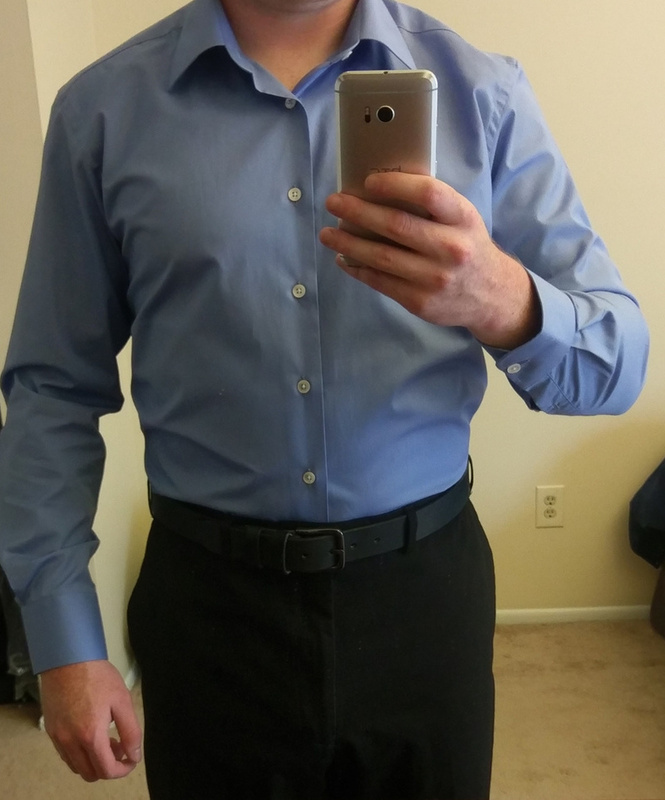 The waist is very close to correct, but in the second picture you can see some bunching on the side - still way better fitting than any of my off-the-rack shirts. I did get the armholes just a tad large. 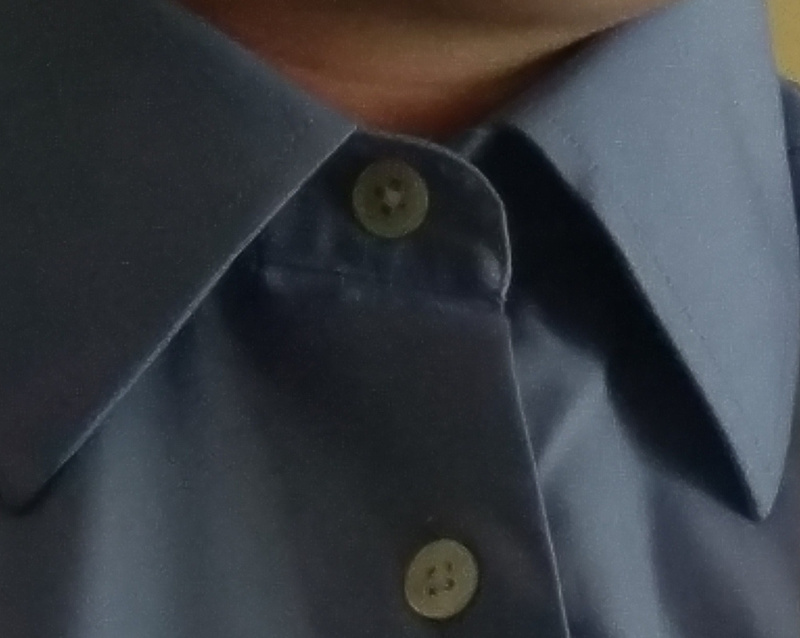 Smaller armholes afford a greater range of motion, which is one of the main benefits I am expecting to get out of made-to-measure shirts. I could probably reduce this measurement by an inch or more. 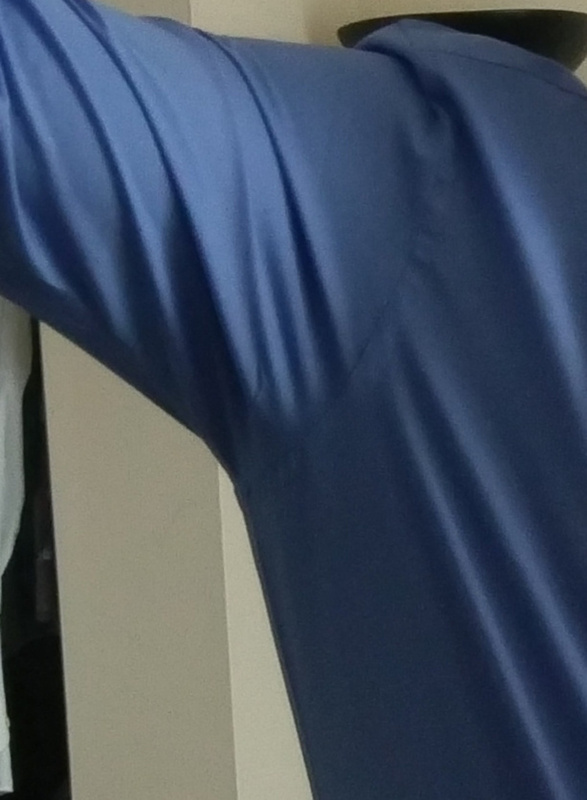 That would bring the point where the armhole meets the side of the shirt up higher resulting in less pulling on the side of the shirt when I raise my arm (as in the picture). In addition to the range of motion benefits, smaller armholes also means raising your arm won't untuck your shirt. The collar is tight. This is only about 1/4" off, but that's enough for it to be reasonably uncomfortable. 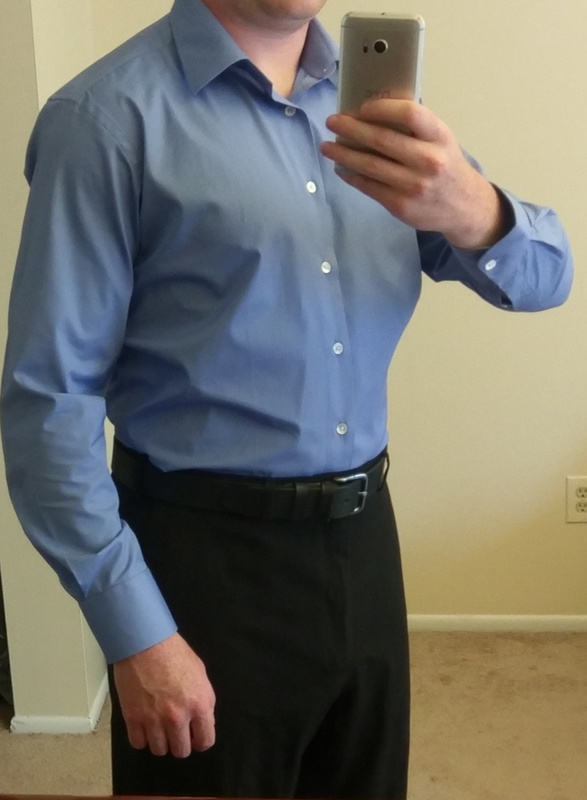 I think it looks great without a tie though, so I'll be ready for business casual occasions (which is as dressy as it gets where I work). 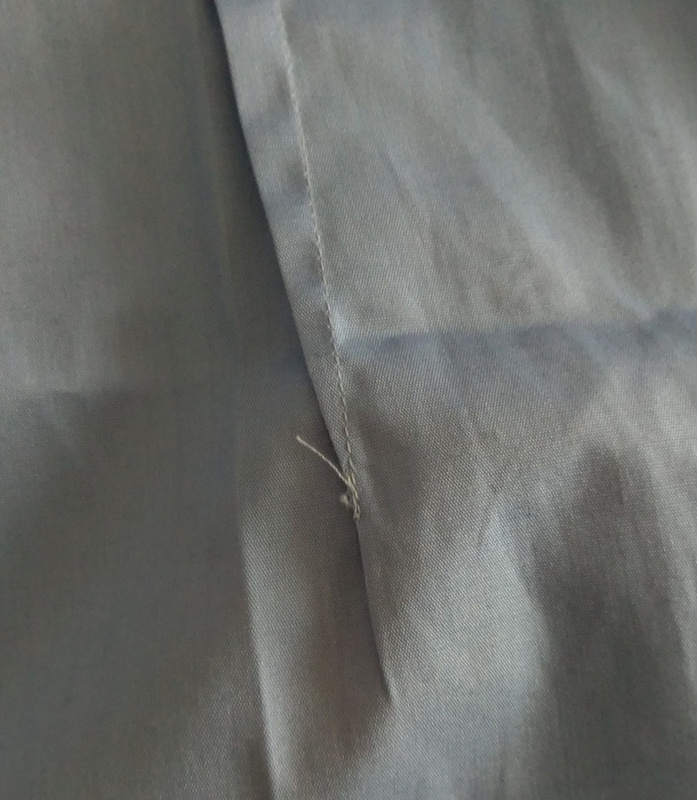 The seams are all clean and regular, but there's a few small workmanship details that show this is not a top-of-the-line shirt. There are loose threads hanging off most buttons along with the twin seams in the back that reduce the waist size. On the back of one of the buttons there is a small defect, but it can't be seen unless you flip the button over. Not a big deal at all. For the money, I am impressed with how well this fits and how well it's made. 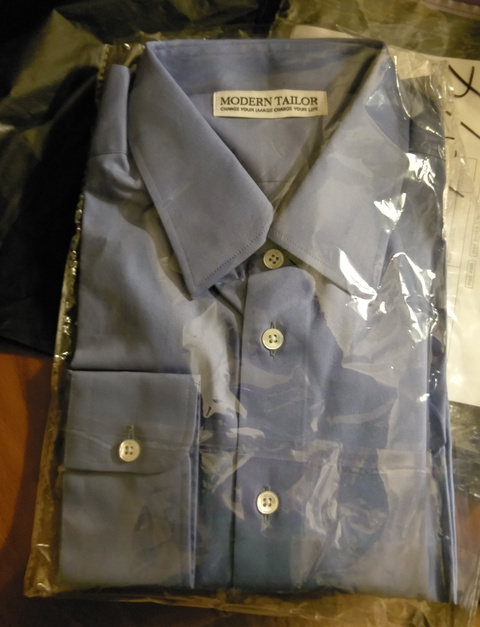 I will definitely be ordering more shirts from Modern Tailor - even at their full price of $60-$80, I consider the fit alone to be worth it. I plan on ordering more casual shirts from them first. I will update my measurements to take into account how this one fit and will definitely keep you updated when I get another.